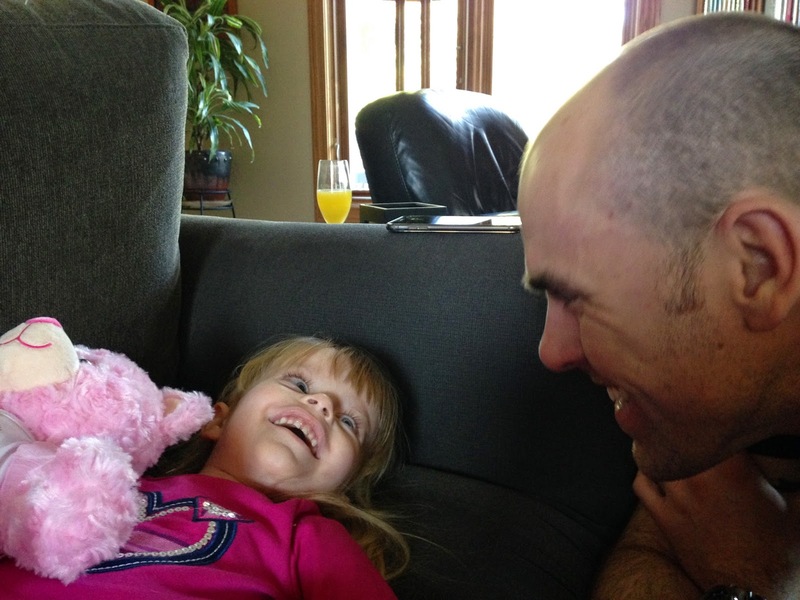 A Grace Filled Journey: Happy Birthday, Aunt Emily! Happy Birthday, Aunt Emily! She's officially 29, and for the very first time! And we're so glad we got to help her celebrate this weekend. 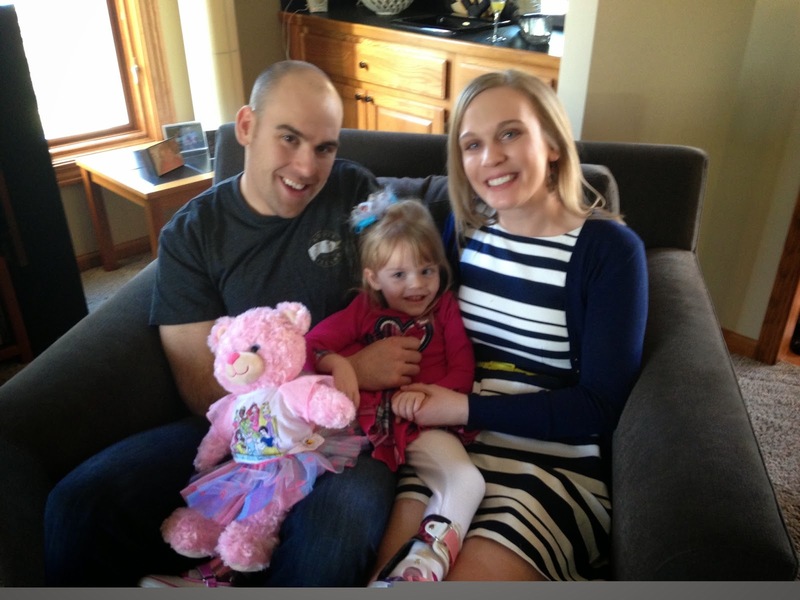 Johnny and Emily were back in Illinois this weekend to celebrate Emily's birthday with her family in Lombard. The Voss family is always so gracious to invite us up to come and see Johnny and Emily. It's still a four-hour drive, but it's much closer than Washington, D.C.
Grace is all smiles hanging out with Aunt Emily and Uncle John. Over the past ten years or so, we've made the trip to Lombard more times than I can count for weddings, showers, parties and just visits. I've even been up to be the guest speaker at Emily's sister Malory's high school journalism class once. And in all those visits, Emily's family has become part of ours too. I know they're technically my brother's in-laws, but I think we've sort of adopted them - or maybe they adopted us. It's hard to tell who is happier in this photo . . .
Grace has been on several trips to Lombard too. Emily's brother has a son, just a month or so younger than Grace, so it's always been fun to see the kids together. This trip, Emily's mom and dad had a pink princess bear made for Grace at Build-a-Bear, and Lyncoln even helped her open it up. It was so sweet. And the Vosses have also become part of our "Grace Filled Journey." They've been a big financial support to the INAD research study, and it was so much fun to see them wearing purple "Gracelets" this weekend. We continue to be humbled by the love and support so many have shown to us on this journey, and we are forever grateful to each and every one of you who lift us up in prayer. 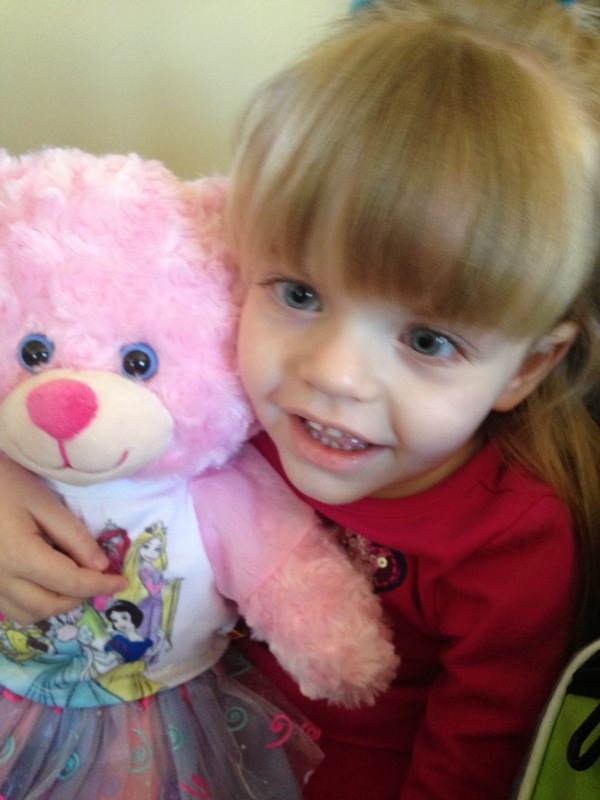 Grace and her new pink princess bear. She just loved it. We spent a long time in the car this weekend for just a few short hours to visit with our family, but it was worth every single minute.